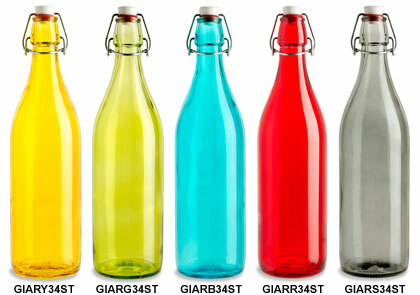 These swing top bottles are the same "keeper bottle" style as the clear bottles we offer, and are now available in yellow, red, green, blue, and gray. This is a great way to compliment the contents of your bottle, match your branding, the décor in your shop or restaurant, or jazz up your packaging. All prices include swing top.